1. Provocations, Infamy, Apologies– López y Rivas analyzes the government’s negative comments about those indigenous peoples who resist the PIM (Morelos Integral Project) and the importance of the April 9 and 10 demonstrations of resistance to the project on the 100th anniversary of Emiliano Zapata’s assassination. The National Indigenous Congress (CNI), the Indigenous Government Council (CIG) and the EZLN are focusing their energies on Morelos now, and hope to model this national and international resistance so that it can also be used against the Maya Train and other megaprojects, like the Trans-Isthmus Corridor. 3. Burial without a corpse– Gustavo Esteva comments on AMLO’s assertion that neoliberalism is ended in Mexico, using the referendum (consulta) on the Isthmus of Tehuantepec Development Program as an example of neoliberalism alive and well. This article explains the Trans-Isthmus Corridor and it’s connection to the Special Economic Zones. An informative read! 4. Marichuy: Seeking an apology from Spain, a simulation– María de Jesús Patricio Martínez (Marichuy), spokeswoman for the CNI-CIG, thinks that AMLO asking for an apology from Spain for its invasion of the land now named Mexico is just for show and it would be much better if AMLO stopped dispossessing indigenous peoples from their lands. 1. CNI-CIG-EZLN Statement: Samir Lives, the struggle continues– This is the statement from the 3rd National Assembly of the National Indigenous Congress (CNI), the Indigenous Government Council (CIG) and the Zapatista National Liberation Army (EZLN). It is an analysis of the current situation in indigenous communities throughout Mexico in relation to the AMLO government and its capitalist mega-projects. An excellent summary! 2. Puerto Madero, Chiapas, disappears due to climate change– A Chiapas scientist and academic warns that Chiapas would be one of the states most affected by climate change due to an increase in the average sea level. 3. Chiapas teachers declare that they are “in resistance and rebellion”– Chiapas teachers belonging to Local 7 of the National Education Workers Union marched in the state capital of Chiapas against application of Peña Nieto’s education reform, which AMLO said he would cancel. Teachers say it is still being applied to them in Chiapas. 4. Film successes and contemporaneous Mexican racism– Mariana Mora discusses the racism produced in Mexico over Yalitza Aparicio’s Oscar nomination for her performance in Roma. 5. Constructing the Maya Train “is going to be a disaster,” Francisco Toledo– The famous painter is concerned about the ecological damage from the train and urges the government to provide more information and to have a meaningful consultation with the indigenous communities affected to obtain their agreement. 6. Statement of the CNI-CIG-EZLN on the murder of Compañero Samir Flores Soberanes – The CNI-CIG-EZLN denounce the murder of a CNI compañero who was a leader in the opposition movement against the Morelos Integral Project (PIM, its initials in Spanish). 1. The Maya Train: the Zapatistas are right – The author of this opinion piece suggests that López Obrador’s economic ideas are problematic and that he is pro-development in an old fashioned way that doesn’t work today in a globalized world. He discusses this in relation to the Maya Train, which he says will disrupt both the way of life and the environment in the places where the train stops. This is an important analysis regarding the Maya Train. 2. EZLN: 25 years of anticapitalist struggle– An excellent analysis from Gilberto López y Rivas as to the racism revealed in the attacks on the Zapatistas and the fact that Andrés Manuel López Obrador (AMLO), has done nothing to stop these attacks. Therefore, López y Rivas concludes that the huge military display and Sup Moisés’ claim that “we are all alone” is a call for supporters of Zapatismo to pay attention and be on the alert to what might happen. 3. EZLN: solidarity recognition– This is an article about the global solidarity letter in support of the Zapatistas with a link so that you can sign on to the letter and express your solidarity and support. 4. The Marshall Plan and border Imperialism – This article reveals a US/Mexico “development” plan for southern Mexico and the part of Central America that people are leaving to seek refuge and asylum. It also reveals that some of the financing will come from US private investment. The article offers an important understanding of the relationship between immigration and the “development” plans for southern Mexico. Copyright © 2018 Chiapas Support Committee, All rights reserved. 2. Saturday, February 23, 2019 – Waffles & Zapatismo – 10:30 am to 1 pm – Mario Galván from the Zapatista Solidarity Coalition in Sacramento will give a Report on the Gathering of Networks in support of the CNI-CIG and the EZLN’s 25th Anniversary celebration. Mario attended both events, which recently took place in Chiapas. The presentation and discussion are from 11 am to 1 pm. Food is available at 10:30 am. Chiapas Support Committee Office, Upstairs at the Omni Commons, 4799 Shattuck Ave., Oakland. There are currently attacks against the Zapatistas throughout social media in Mexico and elsewhere from supporters of Mexico’s new president (AMLO) because the Zapatistas stated their opposition to and their intent to resist the mega-projects AMLO announced in Chiapas and other indigenous lands in southern Mexico. The following articles concern this polemic. We will also discuss this at both events listed above. 1. Words of the EZLN’s CCRI-CG to the Zapatista Peoples on the 25th Anniversary of the Beginning of the War Against Oblivion – Subcomandante Moisés speaks to the rebel insurgents, autonomous authorities, milicianos and civilian support base of the EZLN saying: “We are alone, just like we were 25 years ago” and thereby causing concern among supporters. 2. The Fourth Transformation? – Andrés Manuel López Obrador (AMLO), Mexico’s new president calls his presidential project the Fourth Transformation. Gilberto López y Rivas analyzes what that claim means and critically questions it. This is an important article for understanding the current polemic. 3. Bertolucci in the Lacandon– Luis Hernández Navarro describes the 25th anniversary celebration and compares it to an epic Bertolucci film, a show of power from a political-military force… This is a must read! 4. Letter of Solidarity and Support for Zapatista Resistance and Autonomy– The Chiapas Support Committee signed onto this important worldwide letter of support for the Zapatistas signed by 700 intellectuals, academics, artists, activists and people of goodwill. This is an excellent letter that clearly addresses the current issues and aggressions affecting the Zapatistas. 1. Happy Holidays to all our Friends and Supporters! Thank you for attending our events, participating in our classes, reading our news and contributing to our work in Chiapas. We hope you enjoy a safe and happy holiday season. 2. Support Zapatista Parents Build Schools for their Children – The Chiapas Support Committee’s annual fundraising letter asks you to make a dream come true for Zapatista parents and children by making a donation to the Las Garrucha Education Fund, a fund to help finance the construction of 4 autonomous middle schools in the La Garrucha region, one in each of the 4 municipalities that comprise the region. 1. Invitation to the celebration of the 25th Anniversary of the Zapatista Uprising and to a Gathering of Networks – This EZLN communiqué gives details about the New Years Eve celebration of the 25th Anniversary and the Gathering of support networks that precedes it. The communiqué includes a link for registration. 2. The historical meanings of the Kurdish revolution – Gilberto López y Rivas describes how the the revolutionary experience of the Kurdish people, particularly in Rojava (northern Syria), with what is called Democratic Confederalism, together with the autonomous governments of the Zapatista Mayas of the EZLN in Chiapas, constitute highly advanced alternative emancipatory processes. This is an important piece! 3. A qualitative leap in the storms– Raúl Zibechi uses the recent California fires as an example of the storms caused by climate change. He also discusses other examples and then spells out ways that we are destroying the environment and thereby causing the storms. 4. The Maya Train will destroy the last lung of the Mexican Southeast – A Chiapas professor explains the environmental and cultural damage that the Maya Train (Tren Maya) can cause and exposes the enormous scope of this mega-tourism and real estate project. 1. Donate to decolonize education for Indigenous Zapatista children– The Good Government Junta in the Caracol of La Garrucha and the regional education promoters are asking for our help to build 4 middle schools, one for each autonomous municipio (municipality) in that jungle region. You can help Zapatista children by reading about this request and making a donation. 2. EZLN: “At least 4,000 masked people” at the initiation of the “Caracol of our Life”– On behalf of the EZLN, Sup Galeano invites everyone to the 1st Zapatista film festival in Chiapas from November 1-5, 2018. According to this invite, it will be held in both Oventik and Cideci and is expected to be an annual event. 3. 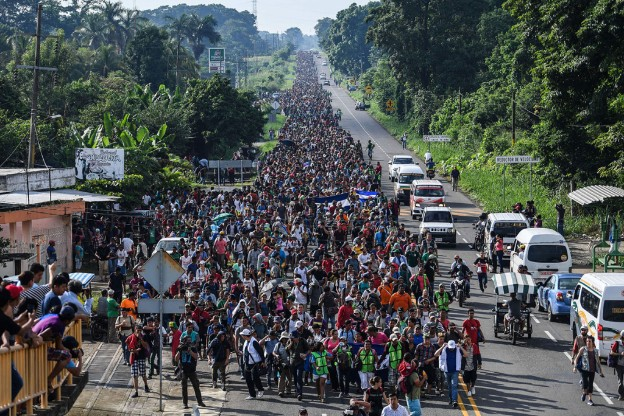 The new Honduran exodus – Luis Hernández Navarro spells out the role of neoliberal globalization and the US government in the dramatic situation driving this caravan. If you hear people using the word “invaders” when referring to the caravan, please refer them to this article! 4. The anticapitalist struggle of the EZLN and the CNI-CIG– López y Rivas analyzes the Second National Assembly of the CNI-CIG-EZLN, and says that it ratifies a political subject that cannot be made invisible by the racism of the political class. 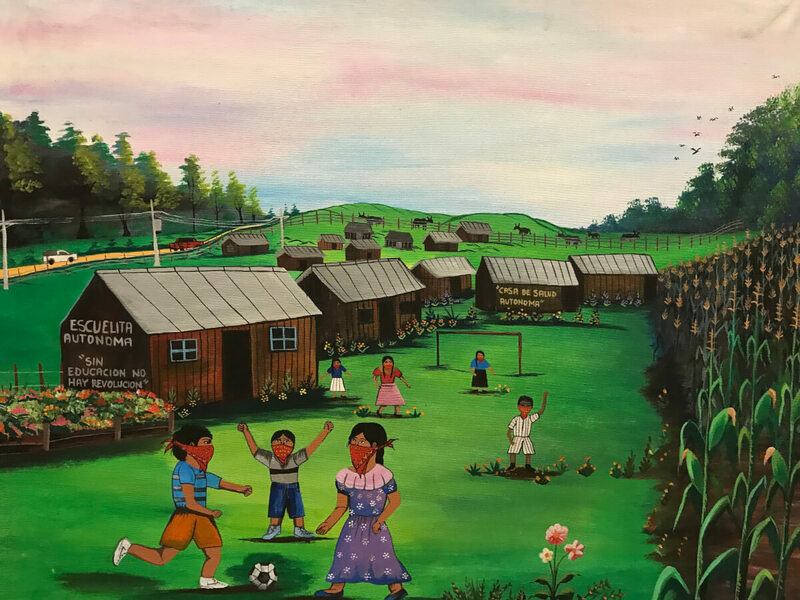 The Chiapas Support Committee (CSC) received some long-awaited news from the Good Government Board (Junta) and the regional education coordinators in the La Garrucha region of Zapatista Territory: they are ready to begin a secondary (middle) school project. The CSC has been working with the Junta and the education coordinators on primary education for the last 7 years. Some of you have donated to support that work, and now we’re asking you to donate to this essential education project. "SIN EDUCACIÓN, NO HAY REVOLUCIÓN"
After the Uprising, the Zapatistas prioritized the construction of their own autonomous government, which includes developing an autonomous education system that decolonizes teaching and learning. Education trainers came from the northern states to help with the development of a curriculum and the capacity building of indigenous peoples in the communities to become teachers, or education promoters as they are called in Zapatista Territory, and also to become trainers (formadores) of teachers. Each community selects its own teacher in a community assembly. The curriculum falls within four basic categories (subjects): mathematics, language, history, and environment (course information at link). The same subjects are taught in both primary school and secondary school at an age-appropriate level. The education coordinators have asked the Chiapas Support Committee to fund the training of secondary school teachers from the four autonomous Zapatista municipios (counties) that comprise the Caracol of La Garrucha. They have also asked us to fund the construction of 4 classrooms, one in each of the four middle schools to be constructed (one in each municipality belonging to the Caracol of La Garrucha). The total cost of their request is approximately $25,000.00 US dollars and we’re asking you to make a generous contribution to that crucial project. You can make your donation online via PayPal by going to our website and clicking on the donate button.